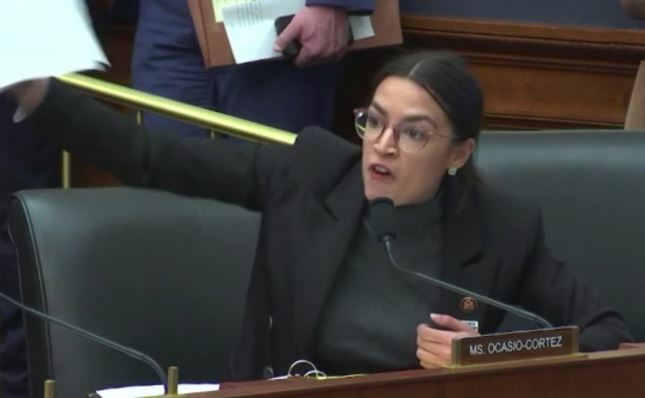 While the Senate rejected the Green New Deal on Tuesday on a 57-0 vote, New York Representative Alexandria Ocasio-Cortez laid out her vision of why this is needed and why concern for the environment is not simply an elitist concern. “When we talk about the concern for the environment as an elitist concern, one year ago I was waitressing in a taco shop in downtown Manhattan. I just got health insurance for the first time a month ago. This is not an elitist issue. This is a quality of life issue. “You want to tell people that their concern and their desire for clean air and clean water is elitist? Tell that to the kids in the South Bronx which are suffering from the highest rates of childhood asthma in the country. Tell that to the families in Flint whose kids, their blood is ascending in lead levels, their brains are damaged for the rest of their lives. Call them elitist. You’re telling them that those kids are trying to get on a plane to Davos? People are dying! “They are dying and the response across the other side of the aisle is to introduce an amendment five minutes before a hearing in a mark-up – this is serious. This should not be a partisan issue. This is about our constituents and all of our lives. Iowa, Nebraska, broad swaths of the Midwest are drowning right now, under water. Farms, town that will never be recovered and never come back. “And we’re here and people are more concerned with helping oil companies than helping their own families. I don’t think so. This is about our lives. This is about American lives and it should not be partisan – science should not be partisan. The Congresswoman was responding to Wisconsin Republican Sean Duffy’s amendment in a meeting of the Financial Services Committee that would force a homelessness bill that was being debated to meet “green” standards. “The Green New Deal is one that if you are a rich liberal from maybe New York or California it sounds great because you can afford to retrofit your home or build a new home that has a zero emissions, that is energy efficient, affordable and safe,” he said. A clip of her speech was tweeted by a liberal activist on Tuesday night, and by Wednesday had 4.7 million views, and was retweeted almost 50,000 times and had almost 125,000 likes as of Wednesday morning. The Senate rejected the Green New Deal on Tuesday, with Democrats present voting in protest to what they saw as a political stunt meant to divide their caucus. Sixty-three percent of Americans believe the Republican position on climate change is “outside the mainstream,” according to a recent NBC/Wall Street Journal poll. Crossposted from the Davis Vanguard March 28, 2019.